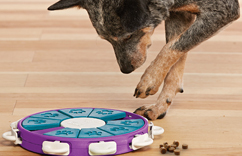 Dog Treat Puzzle Games & Toys. Exercise your dog´s mind and body, prevent boredom and behaviour problems. Sure to make even the most chic fash-hound drool with delight. Earth conscious and oh-so-chic pet bedding and toys you and your furry friend have been dreaming about!